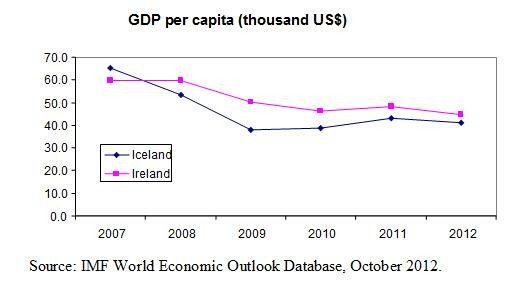 Iceland was one of the earliest and largest victims of the global financial crisis of 2008. Much has been written of the fact that the small (population 320,000) country devalued its currency sharply, and refused to bail out its recently privatised banks. But how well is Iceland doing today? Aggregate GDP data (see chart below) reveal only part of the story. FT Nordic Correspondent Richard Milne looks at the human dimension with interviews of seven Icelanders: an author, a businessman, a member of parliament, a government minister, an academic, a banker, and a human rights lawyer. [Stefán Ólafsson,] professor of sociology at the University of Iceland credits the government with sheltering the worst-off in society. Like many in the Nordic country, he refers frequently to Ireland, seen as the polar opposite to Iceland for rescuing its banks while Reykjavik, reluctantly at first, allowed its own banks to collapse. Disposable income for the poorest 10 per cent of workers fell by 9 per cent in Iceland after the crisis and by 26 per cent in Ireland, according to his figures. At the same time, the richest 10 per cent saw their income drop 38 per cent in Iceland and rise by 8 per cent in Ireland. He praises the attempts to bring some of the richest Icelanders – former bank executives and so-called Viking Raider businessmen – to criminal trial for their role in the crisis. “Whether they will get sentences or not is not the most important thing. Going through the process, that is so important. Otherwise we would have felt everything was rotten and corrupt,” he says. Richard Milne, “Iceland: Under the volcano“, Financial Times, 5 February 2013. The other six interviews are less upbeat, emphasising the huge consumer debts that Icelanders are struggling with. Some consumers borrowed in local currency, but their debt was indexed to prices, so increased in value while wages stagnated. Others borrowed in foreign currency, so faced sharply increased borrowing costs when the Icelandic krona fell by 50% against the euro in the aftermath of the crisis. Read all seven interviews for a glimpse into the social impact that the financial crisis had on this island nation. This entry was posted on Tuesday, February 5th, 2013 at 21:06	and is filed under Finance. You can follow any responses to this entry through the RSS 2.0 feed. Both comments and pings are currently closed.